The KBIT Test (Kaufman Brief Intelligence Test) is a brief, individually administered measure of verbal (vocabulary subtest) and non verbal (Matrices subtest) intelligence. 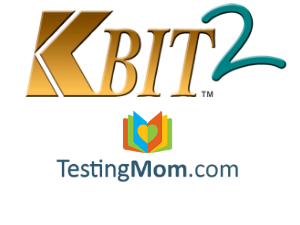 The KBIT-2 test can be used in educational, clinical or research arenas. In 1990 the first KBIT test was introduced and the Kaufman Brief Intelligence Test 2 (KBIT-2 test) followed in 2004.There are three scores for the KBIT test for verbal, non-verbal and overall composite of the IQ. Additionally, this test is also able to identify high-risk children, who may require a more comprehensive evaluation. This is accomplished through the test’s large-scale screening. This exam is developed by leading cognitive ability experts Alan and Nadeen Kaufman, therefore, it is assumed that this test provides highly valid, reliable results and is useful for a broad range of purposes. TestingMom.com offers a wide variety of practice questions and interactive games for the KBIT and other gifted and talented test. Theoretically, the verbal subtests measure crystallized ability and the non verbal subtests measure fluid reasoning. Crystallized intelligence, as measured by the Kaufman Brief Intelligence Test-2, is intelligence which has been learned. This can be acquired through formal schooling, informal teaching by parents, life experiences or any other situation which teaches a child something new. Crystallized intelligence changes over time, as it usually remains the same throughout a child’s life. An adult will have a very different scope of crystallized intelligence than a child will, simply because they have been through more experiences and attended more schooling. In most cases, an intelligence test such as the KBIT-2 is intended to measure crystallized intelligence as it relates to others of the same age group. For example, a gifted program may use the KBIT-2 to measure the crystallized intelligence of kindergarten students against others in their class, to see how far ahead they are relative to other children. The KBIT-2 is also useful in identifying at-risk students, whose crystallized intelligence is below the norm for their age group. To be honest,I need this test for a reserach. Can the KBITZ be substituted for the WISC IV. My daughter is in 1st grade age 6. Her teacher suggested this test. I’m all for it. Is it a good thing, bad thing, suggesting my children is below level or above? She has behavior issues since kindergarten, but maybe because she’s bored or not interested. Is this a standard test for all students? Thanks.